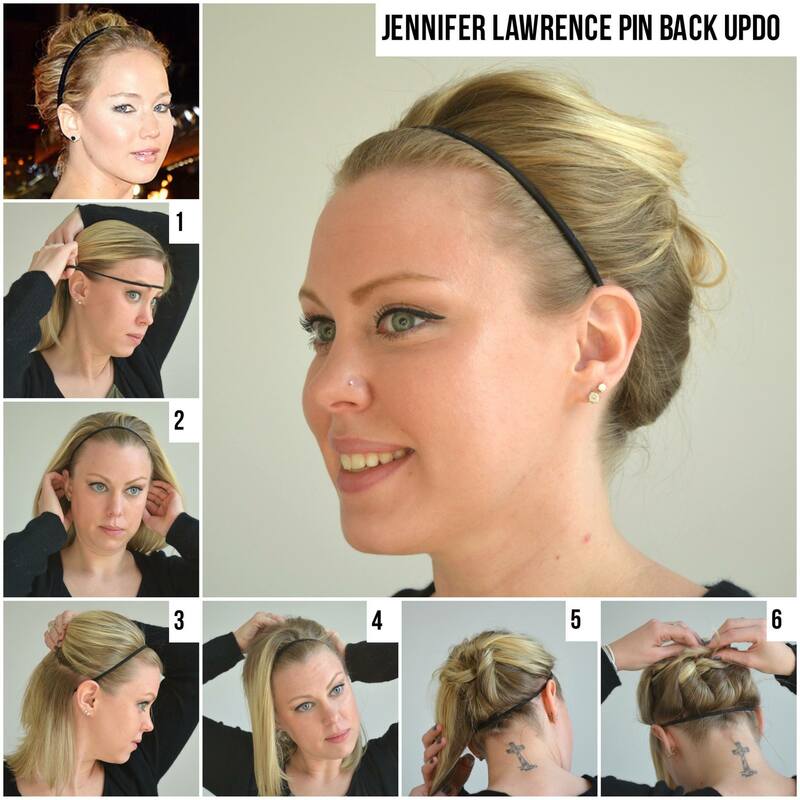 We absolutely love this Jennifer Lawrence red carpet look — So much so, we wanted to show you how super easy it is to recreate! The best part is, all you need is an elastic headband (or a decorative headband if you’re looking for a more fancy look) bobby pins, and a light hair spray if you’re looking for a more put together look. We LOVED the messy look that Jennifer Lawrence achieved by pushing her short grown out pixie cut back and pinning it, so we decided to show you how to recreate this look with longer hair. You will be amazed at how simple it is to achieve this look just by playing around! Step 1: Using your elastic headband, (we used a thin one for this look) push all of the hair off of the front of your face backwards while securing the band behind your ears. This prevents unwanted lumps and bumps around your hairline. Step 2: Adjust the back portion of the headband to a place where it sits comfortably on your head, without pulling or snagging if you turn your head from side to side. If you feel like the band is slipping backwards from your hairline, you may need to continue adjusting it a bit until you find the most comfortable spot. Step 3: Once your headband is in place, separate your hair into two horizontal sections from the ears up. This is what will give you the “bump” that jennifer lawrence naturally achieves with her short, grown out pixie. You can tease this section if you want more volume, but we decided to keep it simple. Step 4: Put a slight pressure on the section in the back and begin to pin the section upwards to maintain the volume. Don’t push the section to high up, or else it will fall and leave no volume. Step 5: We liked to pin the bottom half of the back up by diving it into three vertical sections and twisting them up. You can twist them any way you’d like and tuck the ends into each other to keep the style looking messy but neat. You can really do what whatever you’d like back here to pin your hair back, make it as creative, messy or sleek that you’d like! Step 6: Twist remaining pieces from the top into the bottom and voila! A simple, gorgeous up-do! ← Hairstyling Tip of the Day: Smooth out Baby Hair with a Hot Air Brush!